As I mentioned in many posts I love to read, I always have done since I was a small child. I have always wanted my children to continue with my love of reading, however now that my oldest daughter Chloe is older (she is almost 12) she prefers to spend all of her time on her tablet than reading books. I have been trying to encourage her to read more and when I was given the chance to review a copy of The Luck Uglies I thought that this would be a great chance to encourage her to read more. We were actually sent this book back in the summer and Chloe read it during the summer holidays, but with having a baby I had to take a bit of a break from blogging and have only just got back into blogging recently so I am catching up on overdue blog posts. 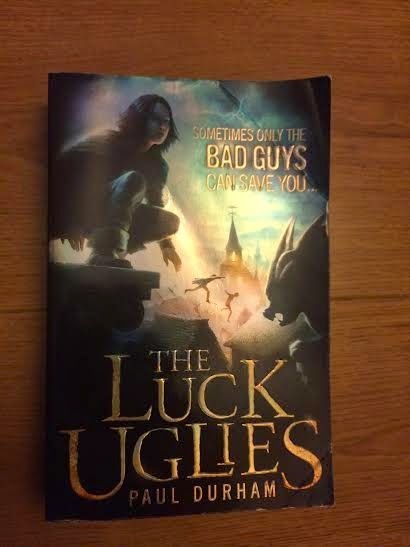 The Luck Uglies is a fantasy story written by Paul Durham and is aimed at children aged 9 + and is published by Harper Collins. Rye has grown up hearing the legend of the Luck Uglies - notorious outlaws who once stalked the streets- but she's not convinced that they ever really existed. Then on the night of the Black Moon, a mysterious stranger steps from the shadows to save Rye's life and a thrilling adventure begins. Rye will need all her courage as she unveils a secret world, discovers the truth behind the legend, and learns that sometimes it takes a villain to save you from a monster ......... "
Obviously, I have not read the book myself but reading the synopsis it sounds brilliant, if I had the time to read it then I defiantly will. So here is what Chloe thought of the book. The first chapter was good but by the time I read the second chapter I found that it was really good and I wanted to keep reading. From then on I found it hard to put the book down as it was a brilliant adventure story. She liked the book so much that even her stepdad ended up reading it on his commute to and from work. He read it in a few days as he too found it hard to put down and said that it was a brilliant book with lots of twists and turns that kept you guessing right to the very end. The second book The Luck Uglies The Fork-Tongued Charmers is due to be realised next year and I think I will have to buy the other half a copy as he seemed to enjoy the book more than anyone and never stopped raving about it. You can buy The Luck Uglies book from amazon priced £5.99 I think that it will make a brilliant Christmas present for any child around Chloe's age who likes fantasy and adventures. * Disclosure: I was sent a copy of this book free of charge for the purpose of this review. Front cover to this book grabs me already.